If your first guess was that .me sites will be popular among English speakers, most probably you were right. As more than 90% of .me domains were sold to people outside Montenegro, it makes sense that mere 10% of pages are in Serbian plus some 2% in Croatian and 2% in Slovenian, languages spoken in the region. Surprise comes with the fact that nearly a quarter of all .me pages are in Asian languages. 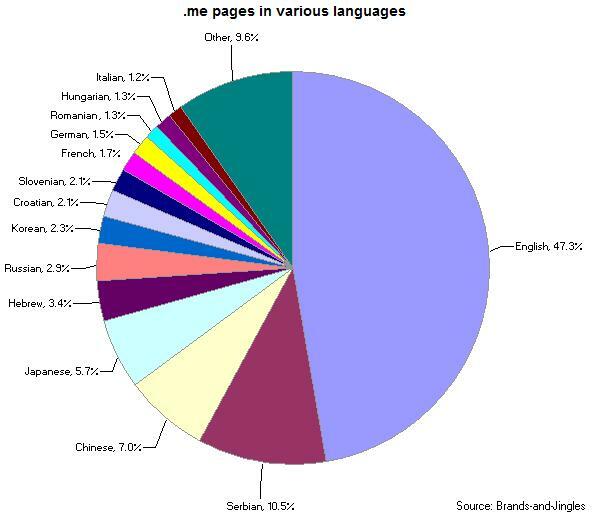 Chinese leading with 7%, followed by Japanese with almost 6%, then Hebrew, Russian, and Korean.